I grew up listening to “oldies” music. Thinking back, it seems like the car radio was always playing either NPR’s All Things Considered, or some pop hit of the ’50s, ’60s, or ’70s. I was fine with it. I’d spend hours listening to my parents’ Beach Boys and Simon & Garfunkel LPs. It wasn’t until high school that I started finding music on my own, but I never quit liking many of those old bubblegum classics. One song that sticks pleasantly in my head to this day is Little Honda by the Beach Boys. What I didn’t know as a kid was that this little ditty is actually about Honda’s iconic and globally ubiquitous Cub. In fact, the more I’ve learned about the Cub/Passport, the more convinced I am that I simply have to own one. While there have been more than 60 million Honda Cubs produced (according to Wikipedia), there are also very capable clones available. 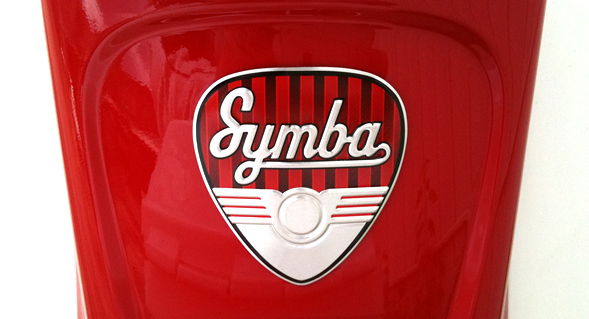 One of the most recent of these to hit these shores is the SYM Symba. The story goes that SYM was one of many contractors employed by Honda over the years to produce the Cub. 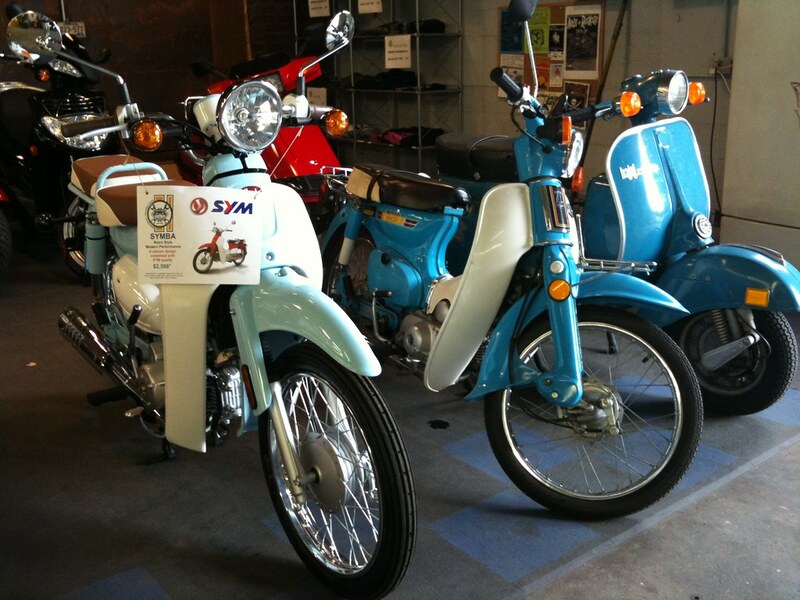 When Honda discontinued the Cub some years ago, SYM kept manufacturing it and sold their own “clone” of the bike. It’s a story we’ve heard over and over from other successful scooter launches here in the states — the Genuine Stella being a prime example. SYM has steadily built a great reputation for making some of the highest quality scooters available anywhere, with fit, finish, and paintwork you won’t find anywhere else. If anybody could do a reborn Cub up right, it’s SYM. So yesterday on my way home from a doctor’s appointment, I stopped by Blue Cat Motors to see if I could sweet talk my way into a Symba demo ride. I met Ryan and got the skinny on this retrotastic little bike. According to him, the Symba is almost bolt for bolt a 100cc Honda Super Cub, but with Mercedes Benz-quality paintwork and a greatly improved front suspension. Ryan knows his Cubs. He’s owned many over the years and has a couple in his garage. So when he says the Symba is the Cub done right, he knows what he’s talking about. 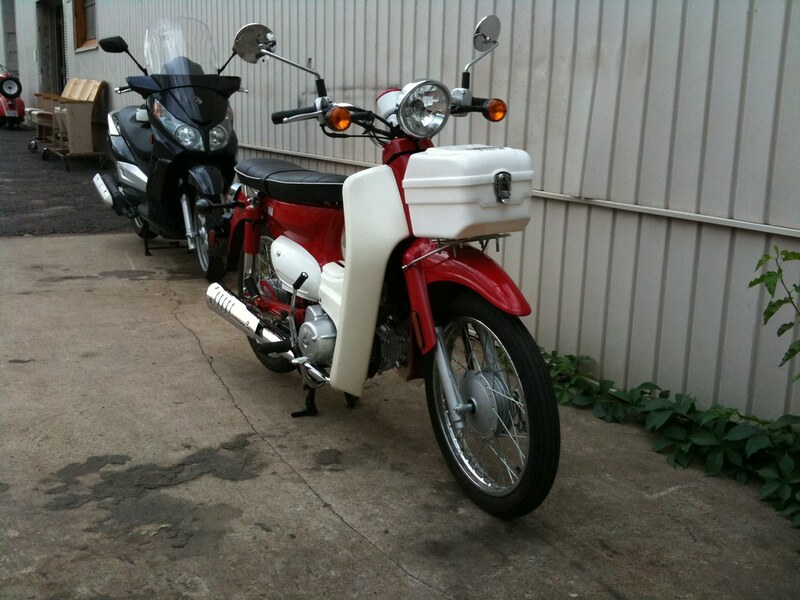 In fact it’s such an improvement in his opinion, that Ryan has put his cherished Honda C70 Passport up for sale because the Symba really is that much better. With fresh air in the tires, I set off of this little red and white piece of motoring history. For the uninitiated, the Symba is moved along by a 100cc 4T carbureted engine mated to a 4-speed transmission. The gearbox is described as semi-automatic, which makes it sound like some sort of machine gun. In reality, I think it’s better described as a semi-manual or “clutchless” manual. If you’ve ever driven an ATV, you’ve probably encountered this style of shifting. Using your left foot, you press a lever and put the bike into 1st gear. There is no clutch, and the bike won’t stall just sitting there, much like an automatic transmission. You twist the throttle and off you go. When it’s time for the next gear, you simply close the throttle, rock the heal shifter with your foot, then open the throttle again. It’s easy as pie and really quick to catch onto. Downshifting is the same proceedure, but your timing is more critical if you want to do it smoothly. Downshift at the wrong time and the bike will lurch a little bit. That’s all part of getting used to it, however. If you’re coming from an automatic scooter background, the only real adjustment is that the rear brake is a lever under your right foot, just like a conventional motorcycle or an old shifter Vespa. Once I got a feel for the shifting and the braking of the Symba, I headed out onto the streets of St. Paul. The power of the bike is best described as optimistic. It’s not a hot rod, but it’s not a dog either. The Symba has a very visceral engine note and lots of fabulous, old school vibration that doesn’t make it feel flimsy, but simply like a bike born of another era. There’s a very Little Engine That Could quality about it. It’s sturdy. It’s determined. Yet it’s surprising spry and nimble like a bicycle. The positively antique-looking drum brakes front and back stop the Symba surprisingly well. Being such a small and simple bike, the drums are perfectly adequate, even with all 6′ 3″ of me aboard. The suspension is certainly not as cush as my Vespa, but again, perfectly adequate. What I quickly learned about the Symba was to simply “go with it” — to let go of any expectations of what a bike should feel like and just embrace all the goofy character the Symba had to offer. It really is like nothing else I’ve ever been on. I was able to quickly build my confidence with the Symba. It’s like a pet — terribly good company — like a friendly labrador that is just excited to be out and about. It’s forgiving and unassuming handling simply makes you want to keep riding it. I told Ryan I’d be back in 15 minutes. Now I wanted to take an hour. I wanted an afternoon. Damn it all, I wanted a Symba. Thanks for the description! I’ve wanted to own one of these for years, but the very limited used market of 1980-1983 Honda Passports are all 70cc, and most have seen better days or are 6V, which makes for an interesting service experience. I very much hope they’re bringing this to Canada. I’m not sure who the Canadian importer is, but if SYM is operating in Canada at all, I’m sure the Symba is on its way! Nice review… I’m very tempted to buy the Symba… I would love it if Honda would decide to start selling them in the states. They sell them in Mexico… just ship a few over. I had a plan worked out for bringing one back in pieces from Mexico when I worked on the border. Unfortunately, I wasn’t down there long enough to implement my plan…. crap. For what it’s worth, both the paintwork and the engine mechanicals on the SYM are going to be nicer than you’ll find on the Honda. It is a “clone” but SYM doesn’t fool around. As bullet-proof as the original Cub is, I bet the Symba is made of solid kryptonite. I’m 6’1″, 195lbs. Would this bike be out of the question for someone my size. I remain curiously interested in this machine; strange. John, you could absolutely ride a Symba. The only question is what are your expectations? This is a bike with a 55 mph top end under ideal conditions. So if you’re just looking to zip around town on small roads, you’d be just fine. I would say that it’d be mandatory that you get the optional bench seat so that you’ll be comfortable as tall as your are (you and me both). What you have to keep in mind is that this is not a fast bike. It’s not dangerously slow or anything, but it’s not going to win any races. It’s a cruiser bike, plain and simple. 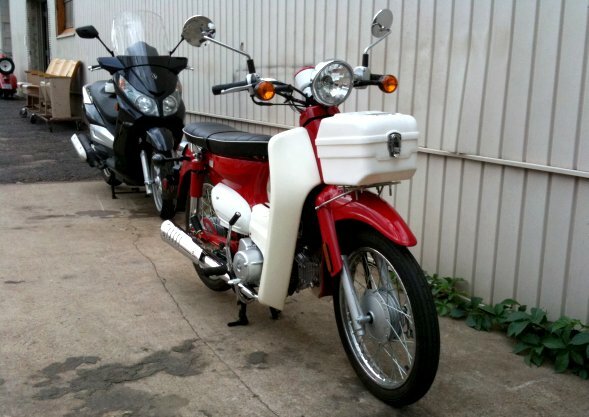 It’s the Honda Super Cub that the world has been using to get around for decades. If your expectations are realistic, I think you’d have a great time. One final bit of warning though. Earlier this year, Carter Brothers, the company that imports SYM into the US, had a massive fire at their headquarter warehouse facility. As far as I know, they haven’t quite got their operations fully restored yet. So the future of that company, and them as an SYM importer, is still far enough up in the air that I myself wouldn’t be purchasing an SYM at this point in time. It’s too bad, as it’s absolutely no commentary on the SYM brand. Something to keep in mind. I want to thank you for putting forth the effort to write a great response to my question. Your enthusiasm for the little Symba is infectious. And yes, I’m aware of the machine’s limitations. However, the overall quality and reliability of this bike offers great appeal. I keep hearing everyone talk about the 199 lbs. weight limit. I’m 5’11 and weight roughly about 230. I’m wondering how it’ll handle a rider of my weight? Where did you hear about that weight limit? I’m sure there is a published service weight and I’d be very surprised if it were only 199 lbs. The most you’d have to do is swap out for heavier duty shocks. Just keep in mind that it’s not a powerful machine, so weight is going to matter on the Symba from a performance standpoint in a way it won’t on larger bikes. In the end it’s all about what you want to do with the bike. If you’re just going to putt around, you’ll probably be fine. Great review, N. Got one in NYC and feel like a cool cat since everyone in the world is riding Vespa. Only problem is there’s a conversation around ever corner! Excellent review, Nathaniel. I recently have started looking into scooters, and now, after reading this and many other reviews, I want a Symba. I am 5’11”, 170 pounds. Do you think the standard seat with the bar in the middle would be ok for me? BTW, SYM website lists the weight capacity at 299 lbs. Good to hear! If you’re interested in scooters, I started a news site called ScooterFile. Give it a look.